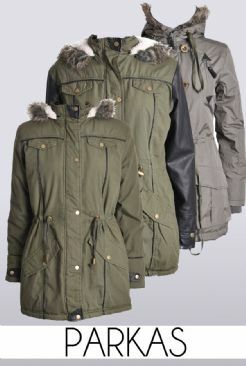 Parka In 3 Styles Available In Regular And Plus Size! All available in sizes 10-26! Option 1 - Cotton twill parka made from 100% cotton with PU accents. Available in khaki only (sizes 10-26). Option 2 - Military parka made from 100% polyester with antique brass details. Available in khaki (sizes 10-26) and black (sizes 18-26). Option 3 - Cotton twill parka made from 100% cotton with PU sleeves. Please refer to the measurements before to ensure the best fit!